Members of the National Executive Committee (NEC) of the Academic Staff Union of Universities (ASUU) yesterday ended their two-day meeting in Kano with a resolve to meet President Goodluck Jonathan today or tomorrow on the outcome of their parley. It was learnt that the union could, after the meeting, call off the five-month-old strike, but with a caveat that the Central Bank of Nigeria (CBN) and the Revenue Mobilisation Allocation and Fiscal Commission (RMAFC) should monitor the agreement it has reached with the federal government. A source at the meeting told LEADERSHIP Sunday that the union will issue a communiqué on the decisions it had taken on Monday, adding that “we may call off the strike on Monday. It is one of the decisions we reached at NEC meeting. 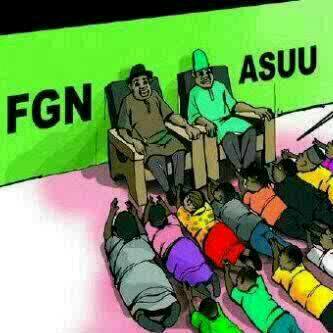 ASUU will meet President Jonathan today or on Monday”. The meeting was held at the Centre for Democratic Research, Mumbayya House, Kano. The source said that ASUU had resolved that, in compliance with the directive of President Jonathan at their last meeting with him, they will present the outcome of the meeting to him directly. He explained that ASUU had resolved that the CBN and RMAFC had to witness the implementation of the agreement it reached with the federal government. According to him, it was the unanimous decision of NEC members to involve other parties, especially the financial sector, in the implementation of the agreement. Other issues discussed at the meeting include the violation of ASUU labour laws by some universities, which have announced resumption dates for students when the strike has not been called off.